Here's the second of the two-part guest post from Dr. Tony McGroarty, a sports psychologist with whom I play basketball. In this concluding post, Tony discusses motivation in the context of specific feedback given by young players and coaches themselves. Although his data is older, newer studies have resulted in similar findings (e.g., the importance of FUN). As in the first part, his ideas apply equally to all sports. If we have the prudence to ask, players will tell us what conditions create motivation to begin playing in the first place, what conditions create the motivation to continue playing and what conditions lower that motivation, sometimes to the point where they drop out. The Athletic Footwear Association sponsored a survey of youth sports participation conducted by the Youth Sports Institute at the University of Michigan. They did ask some kids - 3,900 boys and girls, grades 7 to 12, to be exact. The number one reason both boys and girls gave for playing sports was "To have fun". The first two reasons for quitting a sport were: "I lost interest" and "I was not having fun". The number one change which would bring players back to a sport they quit was, "I would play again if... practices were more fun". The lists follow. These findings speak for the soccer players we are charged to train. They can be seen as guides which steer us in the right direction while developing a mission statement for the organization or a philosophy of coaching. The kids can tell us so much about what they need in order to begin playing soccer and to continue in the game. Their words can be used to help us formulate a set of principles youth coaches can use to increase player motivation. 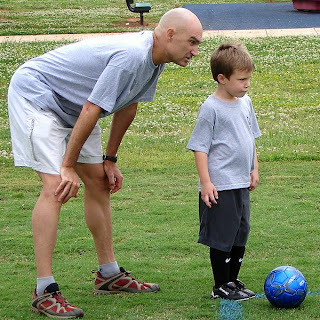 The overriding goal of soccer coaches for all age groups is to find the balance between being an external source of motivation and encouraging the growth of internal motivation. How this is done depends on an assessment of where the athlete is in the process and then judging how much external motivation is necessary to help the player improve. Another guiding principle for the coach is to make the expectations for the players clear and challenging, yet attainable. Coaches should strive to introduce new skills and tactics which stretch their players' abilities; but not so far that the players become too anxious about failing. On the other hand, coaches should avoid making the expectations too low because the players will learn nothing new and become bored. The principle of providing encouragement through the use of positive feedback is more complicated than it appears. It turns out that giving players only positive feedback does less for their motivation than mixing it with honest criticism of their play. Players who receive honest feedback about mistakes as well as instruction on how to improve their game are happier with the sport experience and their coach than are those who are only praised. This is not criticism in the form of putting the player down. It is constructive in that mistakes are identified and corrected. In this way the player is clear about how far off the performance is, about the proper way to execute the skill, and about what to do to improve. The method of offering feedback when a player has made an error or when trying a new move but does not have it down quite right is called the "sandwich" method of offering constructive criticism. Teaching the player how to do it correctly is sandwiched between two evaluative statements. For example, lets say the defender failed to offer support to a teammate on defense and the error in judgment led to a goal against. The coach could make the following three statements: "Where's your head? We went over that yesterday in practice. You have to pay more attention in practices." he coach using the sandwich method to teach the same player would make these three statements: "Jimmy, you didn't support Alex there. When Alex steps up you need to stay connected on the inside. You'll get it next time!" This second coach's statements convey specifics about what the younger, and sometimes the older, player needs from the coach to maintain motivation--to learn new skills and see that the coach has confidence in them. As athletes mature and gain experience through playing time, similar phrases become internalized and are used by players to criticize, correct and encourage themselves. Coaches who adopt the principle of teaching players to think for themselves and to learn from the consequences of making their own decisions will have athletes who learn faster because they are more focused and better able to evaluate themselves and others. Soccer is a game of instant decisions requiring players to be creative on the field. Coaches who are constantly yelling instructions from the sidelines inhibit their players' ability to think for themselves. The players are distracted from what is happening on the field because their attention is directed at the sideline, not on the here-and-now flow of the game. There are some things coaches can do to promote focus, communication and creativity in their soccer players. Most teaching should be confined to practice and half-time. Coaches can help players focus on the flow of the game by being as quiet as possible during the scrimmage at the end of practice and during the game. When a player comes off the field or when the team gathers at half-time, self-evaluation can be encouraged by asking what is going well and what needs to change before the coach launches into instructions. If an important adjustment must be made during the game, the coach can tell the captain or the closest outside midfielder to convey the message to the team on the field. This approach gives players opportunities to practice leadership and effective communication. Fairness and consistency are very important principles for promoting internal motivation in the younger athlete. If players go in and out of the game using rolling substitutions and learn they will play an equal amount of time regardless of how they are performing, then each player will feel relaxed enough to try new skills during the game without the fear of being taken out because of a mistake. Effort is emphasized over immediate results, success is defined by player improvement rather than by goals scored or wins and healthy risk-taking is the norm rather than the exception. This approach most closely resembles the atmosphere of a neighborhood pick-up game where the kids figure it out by themselves. The coach who teaches skills and allows the kids to play the game accelerates the "figure it out" part. The players do not need the coach to show them how to have fun. If we let our young athletes "play" the game, we can learn a lot about human potential from our players--and have fun in the process. When the players and the coaches have fun at practices and games they will be motivated to be with the team again next season. That kind of success is a great source of motivation which makes winners of us all. Dr. Tony McGroarty is a clinical and sport psychologist in the Pittsburgh area. He welcomes your questions and suggestions. Please contact him at: mcgroartyt@msn.com or (412) 983-1790 or 242 S. Highland Ave. Pittsburgh, PA 15206. It's important to note that "winning" isn't in the top 5 for boys or girls! Both care more about having fun. And yes, winning is certainly much more fun than losing, but you don't always have to win to still love playing. Coaches sometimes need to remember that too.